A white t-shirt is a staple in any man's wardrobe and now that summer is on the horizon, I want to introduce you to a new British menswear brand called Heretics. The name 'Heretics' refers to anyone who doesn't conform to an established attitude, doctrine or principle. Throughout the course of history, Heretics helped shape and form the culture that we admire and love today. The Heretics never diluted their artistry even if the prospect of death was right before their eyes. Despite this, Heretics were rarely appreciated for their artistic genius during their lifetime but their legacy is now being celebrated with the launch of 'Heretics' a menswear brand aimed at fashion conscious men. 'Heretics' the brand was started to evangelize the courageous endeavours of Heretics and most of all their genius. The range of t-shirts created by Heretics, embodies the same beliefs as the Heretics that have gone before them with images of women being made a controversial feature in certain designs. Instead of being loud and garish with their controversial designs however, Heretics aims to make their designs sophisticated and chic, channelling elegant and haughty in equal measure. Their début collection features a range of striking and distinctive printed t-shirts incorporating intricate illustrations, risqué images and flashes of colour into the designs. The intricate drawings that dominate the surface of a variety of Heretics' t-shirts are the artwork of 'Biro Man', an artist who spent a month creating these designs with nothing more than a Biro pen. 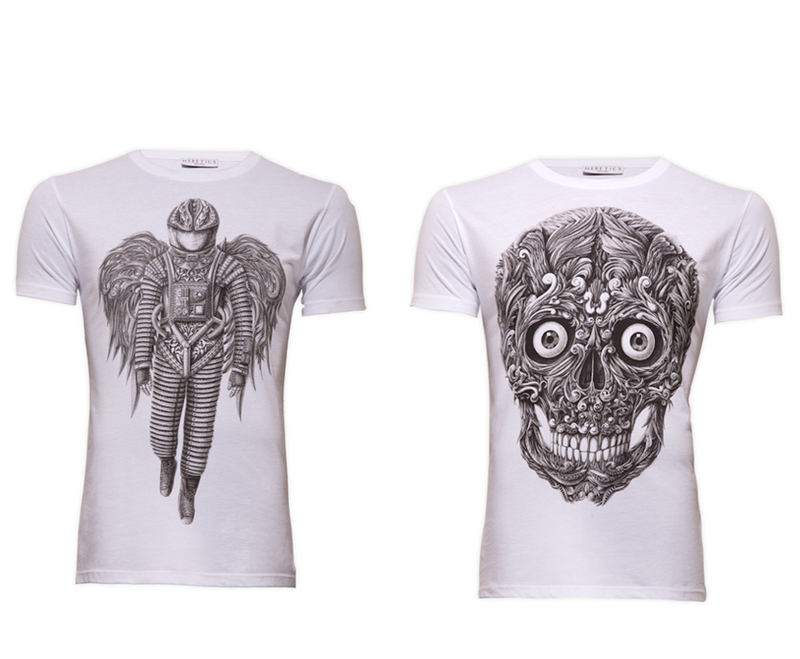 The precise detailing and the meticulous nature of his artwork can be seen in all its glory in the form of the Mexican skull design along with the spaceman. The fun, playful style of these designs makes them accessible to everyone and they offer a stylish alternative to the mass produced designs on offer in stores such as Topman and River Island. Personally, I think that certain designs, such as the Mexican skull, could also make very attractive t-shirts for women wanting to add an androgynous edge to their outfits. All Heretics t-shirts are made in London with the aim to keep the brand local to the UK market. That is not to say that you can only wear them if you are based in the UK... Priced between £25-£30, these t-shirts come in sizes S,M & L and are available to purchase through the Heretics website with delivery available across the globe.